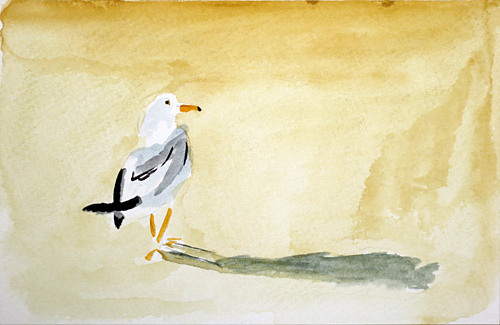 You may bid on this watercolor sketch of a Ring-billed Gull (Larus delawarensis) at the Falmouth (Maine) Public Library's Beauty & the Books Annual Silent Auction. Along with the painting the bid includes an autographed copy of A Beach for the Birds, written and photo-illustrated by Bruce McMillan (Houghton, 1993), which takes place where the Little River flows into Atlantic between Kennebunk and Wells, the Laudholm Farm Beach, the Rachel Carson Wildlife Preserve, and where the photo for the gull watercolor sketch was taken July 8, 2012; included is a paper about the Ring-billed Gull. Also included is a poster, The Literary Map of Maine, published by the Southern Maine Library District and The Maine Sunday Telegram, which includes A Beach for the Birds and the location of the beach. The painting, book and poster will be on display and available for bidding during the month of March 2013 until the final bidding and reception on Thursday March 28th, 5:00-7:00 pm, along with about 200 items by dozens of local artists and craftspersons. For more information visit The Falmouth Memorial Library's web site HERE. (opens in a new window). Estimated value: $160 USD (painting: $100, framing: $10.00, book $40, poster $10). In solid teak frame with glass ready for hanging or standing. Congratulations to Nicky Tibbets, the winning bid a bargain at $25 which went to the Falmouth (Maine) Memorial Library. I don't know Nicky, though we both grew up in Kennebunk, Maine. Many years ago her mother took my father's photography class at the Brick Store Museum in Kennebunk. I donated this painting at the request of my broker, who I recently realized is the son of one of my father's friends and fellow Vice-President of the tongue-in-cheek Kennebunk Dump Association, and who I have fond memories of laughing with my dad while in our living room. It's a small world, isn't it?